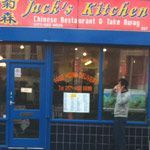 Jack's Kitchen on Brecknock Road is a Chinese restaurant and take away which also offers a delivery service. Do you work at Jack's Kitchen? What did you think of Jack's Kitchen?